Hello everyone and welcome back to one of my signature Ring Of Honor reviews for EyesOnTheRing.com after taking last week of we are back with another great hour of wrestling so lets get to the action featuring more of the fall out from Best In The World 2015. The show began with Dalton Castle coming out to the ring complete with his entire entourage as he gets set to open the show as he faces NJPW's Takaaki Watanabe. Thoughts: This match was pretty damn entertaining, I wasn’t sure if I would like Dalton Castle but the dude has grown on me and is becoming a great fit within ROH. Takaaki Watanabe is also great whenever ROH uses him and these two had great chemistry in their match. The match starts and the two feel each other out, later into the match Takaaki Watanabe uses his Japanese mind control technique to gain control over Dalton Castle’s entourage and they pose and do a bunch of weird things while Dalton Castle looks on in disgust and then proceeds to yell at his people to behave themselves. The two hit each other in the center of the ring with a double clothesline but both manage to make it up before the count of ten. Castle hits Watanabe with a suplex that he pretty much forced Watanabe into. Castle picks up a near fall after a dead lift German suplex. Watanabe recovers quickly and comes back with a back suplex for a near fall of his own. The finish comes when Dalton Castle picks Watanabe up and spins him around and slams him on the mat before covering him for the 1-2-3 and the pinfall victory. Match Result: Dalton Castle defeats Takaaki Watanabe via pinfall after a whirlybird suplex. After the match Dalton grabs a microphone and says that he’s the only real man in ROH which probably will piss off Silas Young. So, it was nice knowing you Dalton Castle because your probably going to die now. Out next is the current reigning and defending ROH World Heavyweight Champion and ROH Television Champion. Kevin Kelly pointed out on commentary that since Jay Lethal now has the World Title in his possession that the TV title is back to saying TV title and isn’t defaced anymore. Nigel McGuinness comes down to the ring and says that Lethal has to choose what belt of the two he has that he wants to vacate. Lethal says that he’s not going to vacate either one of them and Nigel comes back and says that if he wants to be a double champion that he will have to defend both belts on ROH shows so he may have two matches on any given night. Jay Lethal says that he’s going to prove why he’s the best wrestler in the alive by defeating both belts at Death Before Dishonor in two separate matches. This brings out Roderick Strong, Jay Lethal’s opponent for the World Title at Death Before Dishonor. Roderick says he’s going to win the world title at Death Before Dishonor. From there we go inside ROH with the beautiful Mandy Leon as she recaps Best In The World with highlights and such.From there we head to the main event as the Kingdom makes their way to the ring. Maria grabs a microphone and says that it’s not Adam Cole’s fault (not sure what she’s referring to here) she then refers to herself as the leader of the Kingdom. From there Michael Elgin makes his way out to the ring with his Garbagio entrance theme followed by reDRagon to set up for the main event of the night. Thoughts: The match starts in the feeling out process, reDRagon catches Taven and Cole in submissions while Elgin has Bennett up in the air for what seemed like an hour before dropping him to the mat with a suplex. Taven hits a cross body block from the top rope on Adam Cole to score a 2 count. Elgin gets tagged in and quickly gets isolated in the Kingdom’s corner as they had a three on one advantage while reDRagon couldn’t help out much if at all. Later on the outside of the ring Adam Cole throws Kyle O’Reilly into the ringside barricade as hard as he can. O’Reilly recovers after a brief while and then everyone stands in the same spot as Taven dives outside of the ring with a Plancha and takes out everyone including his Kingdom brothers. Back in the ring and Taven and Elgin pair off inside of the ring and Taven hits Elgin with a shining wizard for a near fall. Elgin recovers and grabs Taven and powerbombs him to the outside of the ring for everyone to catch him. Back in the ring and Cole tags in to hit the Panama City Destroyer on Elgin for a near fall. The end of the match came when Cole hits a super kick, O’Reilly comes off of the ropes with a rebound lariat and Fish and O’Reilly hit Chasing The Dragon for the 1-2-3 and the pinfall victory. That’ll do it for me and this review of Ring Of Honor Wrestling Television, two really entertaining matches made for a great hour of wrestling that’s worth checking out if you have the time this week. Hopefully ROH will stick to this two-match format but we shall see. Once they get around to their next PPV they may start cramming in four matches in an hour, which I hope they don’t.In closing don’t forget to follow me on Twitter @Headliner5 and make sure to follow the Eyes On The Ring main account @EyesOnTheRing. 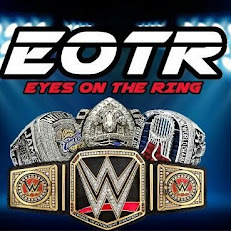 Make sure you check out the radio show over at http://www.blogtalkradio.com/ElitePodcastNetwork and check out the home of Eyes On The Ring located at http://www.EyesOnTheRing.com for more reviews like this plus other stuff that the EOTR decides to provide you with throughout the week. In closing make sure to like us on Facebook at Http://www.Facebook.com/EyesOnTheRing for now I am Nathan saying so long and keep your Eyes On The Ring.